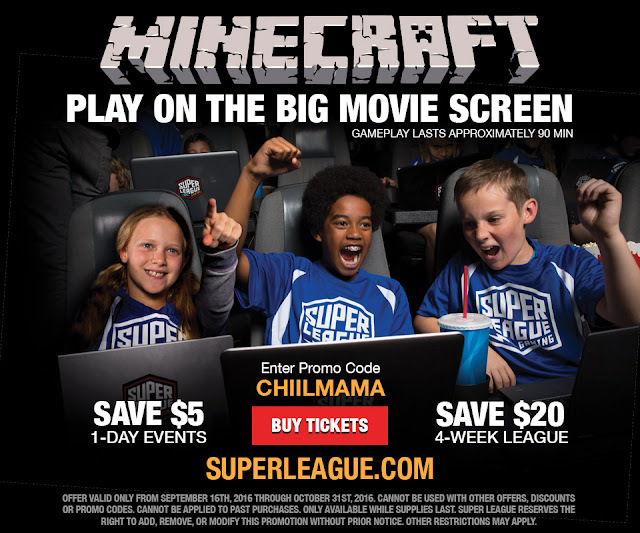 Here at ChiIL Mama, we've partnered up with Super League Gaming in the past, to bring some rockin' giveaways and discounts to our readers. We're pleased to spread the word again for this fall's Minecraft events and competitive leagues nationwide. Disclosure: Thanks to Super League Gaming for providing our readers with a discount, and giveaway tickets. We have been compensated for sharing this information. As always, all opinions are my own. ALL AGES WELCOME: Most participating children are around 6-16 years old. However, gamers of all ages are welcome (as long as they know how to play Minecraft and have it installed on their laptop). Non playing parents/guardians are FREE! 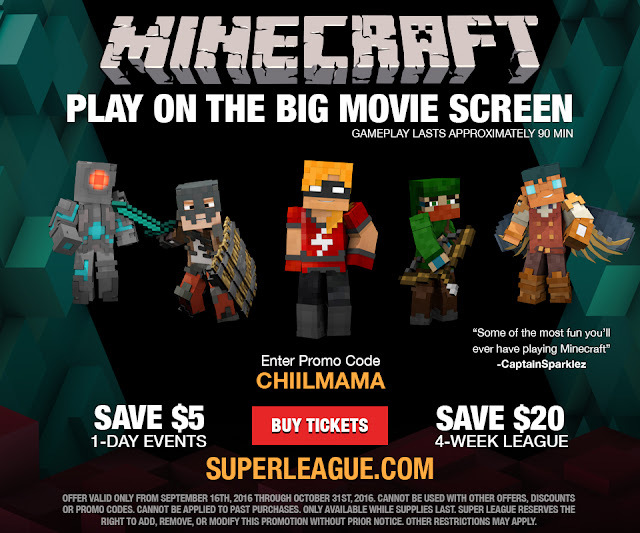 Super League Gaming is having Minecraft events this fall/winter in Bolingbrook. Their events are kid-centric, creating an atmosphere where kids can come play Minecraft in a fun, social environment.... a movie theater! They pride themselves on taking Minecraft, one of the most popular video games out there for kids, and turning it into a social experience on the big screen. Kids will play together in a fun environment, meet other kids with similar interests and get to show off their Minecraft skills. Adults attend FREE. From September 20 to October 1, you’ll be able to experience one of Super League's custom built, one-of- a-kind Minecraft worlds. Explore the outer reaches of space, save the world as a superhero or journey to the depths of the deep sea. Build, battle, and enjoy a variety of games you can’t get anywhere else, with all the action broadcast on the movie theatre’s big screen. Come for one or come for them all. Coming soon to a movie theatre near you is Super League's Metropolis Madness! This four-week league runs once per week from October 18 to November 9. A cross-country adventure unlike any other, you’ll travel through the biggest cities, sights, and landmarks in America, including the Indianapolis Motor Speedway, Alcatraz Prison in San Francisco, and the Hollywood Sign in Los Angeles.